There are various treatment modalities that are effective in improving the signs of acne, acne scars, sun damage, fine lines, and brown spots. However, finding a skin care treatment isn’t the only challenge many patients face. Rather, the challenge lies in distinguishing which treatment will be most effective. So how can you tell which treatment is the best? Here, we’re uncovering the differences between two of our most common medspa treatments: Microdermabrasion and Chemical peels. Follow along as we reveal what both treatments entail, how to know which is right for you, and what to do if neither seem to fit your current skin care situation. Microdermabrasion is a safe, non-invasive treatment that works to improve fine lines, aging skin, and brown spots by removing old skin cells. The treatment is called micro(epi)dermabrasion because it only affects the epidermis, which is the outermost layer of your skin. The treatment is painless and causes no damage to the skin. The procedure buffers your skin by gently exfoliating its surface. It’s performed with a handheld device that uses micro-crystals to strip away the outermost layer of your skin. This removes dead skin cells and produces new, fresher-looking skin. Similar to microdermabrasion, chemical peels work to improve various skin blemishes. But the main difference between the two is that chemical peels can improve impurities deep within the layers of the skin. However, this is completely dependent on the strength of your chemical peel. For example, a light to mild chemical peel will provide similar results as microdermabrasion by staying closer to the skin’s surface; whereas a stronger peel will penetrate deeper into your skin for a more aggressive treatment. During your treatment, a chemical solution is applied to the targeted area, such as the face or neck. The chemical components exfoliate your skin and eventually cause your skin to shed or peel. After your skin has peeled, you’ll experience smoother, younger-looking skin. Chemical peels are used to improve the overall appearance of your skin. However, it’s important to keep in mind that the treatment, results, and recovery time will vary depending on the strength of your chemical peel and sensitivity of your skin. Now that you understand the difference between our microdermabrasion and chemical peel treatments, here are answers to some of the common questions we’re asked about the two. What does microdermabrasion treat? This treatment is most effective for improving impurities on the outmost layer of your skin, such as brown spots and acne. Is the treatment safe? Yes. Microdermabrasion is non-invasive and a completely safe treatment. Should I expect to experience pain? The treatment only impacts your epidermis, so there won’t be any pain. Many patients have reported that the treatment feels like a cat licking your skin. What are the results of microdermabrasion? After your treatment, you should expect to see fresh, invigorated, glowing skin. Is there any downtime? Microdermabrasion involves minimal downtime after your procedure. Typically, our patients experience a recovery time of one to two days. How many treatments are necessary? This is completely up to you. Some patients have one treatment and feel satisfied with their results, while others prefer to have several treatments throughout the year. 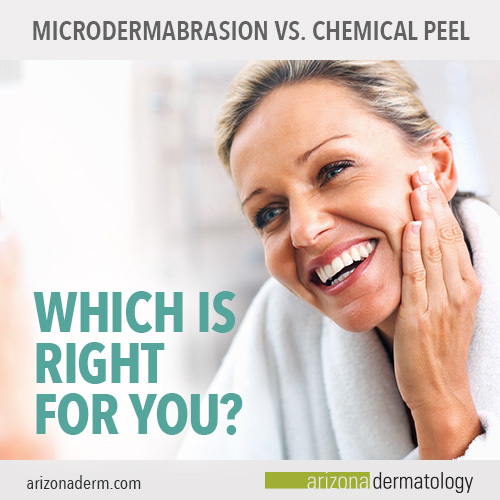 What chemical peels are offered at Arizona Dermatology? Our office provides a variety of chemical peels including: perfect peel, transform peel, vitalize peel, alpha beta acid peel, glycolic acid peel, salicylic acid peel, and modified Jennser’s peel. How do I know whether a light, mild, or strong peel is right for me? This is typically dependent on the sensitivity level of your skin and how aggressive you’d like your treatment to be. Do chemical peels reduce the risk of skin cancer? Yes. Chemical peels can aid in reducing the risk of certain skin cancers by exfoliating or removing the top layer of skin. Are chemical peels painful? Stronger peels are harsher than lighter peels. With stronger peels, you may consider taking Ibuprofen before your procedure. Is there any downtime? Your downtime is completely dependent on the strength of your peel. What should I expect during the recovery time? During your healing time, anticipate your skin to peel. Because of this, we suggest avoiding the sun and planning the recovery period around social events so it doesn’t interfere with your social event calendar. After covering the premise of both microdermabrasion and chemical peels, you should feel more confident in knowing which treatment is right for you. If not, we recommend coming in for a consultation appointment. When determining which treatment is best for your needs, we recommend consulting with an experienced physician. At Arizona Dermatology, we’ll help you find an effective treatment for your individual case. Our main objective is to assist you in accomplishing your skin-improvement goals. What if neither sound right for me? If neither a microdermabrasion or chemical peel treatment seem like the right treatment for your skin care needs—don’t worry. We offer a wide range of both medspa and cosmetic services all with varying deliverables, to give you the results you desire. Browse through our medspa and cosmetic services to get a better idea of what we offer or simply give us a call. As industry experts, we’ll be able to direct you towards the right treatment for you.